No matter what type of flooring you have, making floors look their best can be a challenge. Traffic, age, neglect, and cleaning with the wrong products can do a number on floors. You may be looking for the right vinyl floor cleaner, but the plethora of options can make it difficult to choose. Fortunately, we have reviewed 10 of the Best Vinyl Floor Cleaners on the market. It’s important to choose the right cleaner to avoid damage, prevent health problems and enhance the overall condition of your floors. 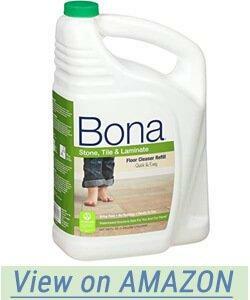 The company Bona® has provided a floor cleaner that’s the bona fide real thing for cleaning hardwood floors. The formula cleans vinyl, linoleum, porous marble, terrazzo, LVT and any tile that isn’t wax-sealed. It leaves behind no streaks and a shine that’s not too overwhelming. The water-based cleaner is formulated to dry fast with no residue that leaves floors dull. Furthermore, the splash free technology makes it easier to pour, and there’s no need to rinse after use. Bona® Stone, Tile & Laminate Floor Cleaner is also backed by the Greenguard Gold certification, confirming that it’s safe to use even around toddlers. 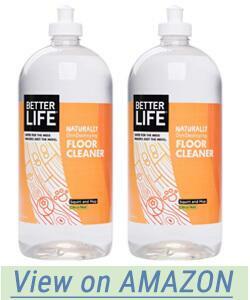 This product earns a standing ovation for its superior cleaning and deodorizing formula that is also safe for floors. However, it’s not perfect. It must be diluted well or you may end up with sticky, streaky floors. Lastly, it may be safe for floors but not necessarily for you. It might irritate the skin and eyes, and the manufacturer recommends wearing gloves and eye protection during use. 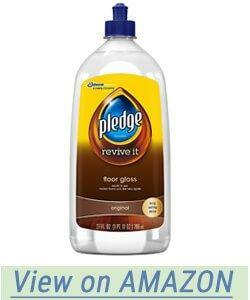 We highly recommend this product if you need to remove dirt and smells and want to protect the condition of your floor. It’s not easy to come across such a superior cleanser. We wouldn’t recommend this for use without eye and skin protective gear or around children and pets. OdoBan has been creating quality cleaning formulas since 1980. Specially formulated to safely clean hard surfaces, the OdoBan Neutral pH cleans and shines vinyl, laminate, porcelain and tile. It’s also streak free. 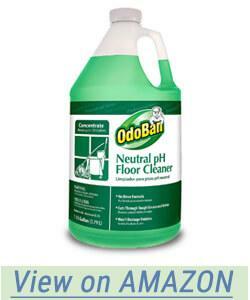 The neutral pH ensures that your floors won’t incur any damage. It also deodorizes and even removes the smell of cigarettes, urine and animals. The rinse-free formula was initially created to work on industrial floors, such as those in hospitals. It also works on old flooring. OdoBan comes in a 1-gallon container and can make up to 128 gallons. We highly recommend this product if you need to remove dirt and smells and want to protect the condition of your floor. It’s not easy to come across such a superior cleanser. We wouldn’t recommend this for use without eye and skin protective gear or around children and pets. If you’re adamant about safety and purity along with cleanliness, Better Life Natural Plant Based All-Surface cleaner might be a breath of fresh air. It uses all-natural ingredients with you and the environment in mind without sacrificing power. It’s also safer for the environment and uses solar energy to produce packaging, which is also recyclable. Better Life’s product formulas are never tested on animals. Furthermore, their biodegradable ingredients break down up to five times faster compared to other conventional and natural brands on the market. Debunking the assumption that natural, plant-based products don’t work as well, it attacks even stubborn grime. It works on sealed floors, like bamboo, ceramic, laminate, hardwood, stone, and vinyl. The cleaner lathers up easily, so a little goes a long way. Customers also love the refreshing citrus scent. We really like that this product uses plant-based cleansing technology and materials that are safe for humans, the environment, animals, and floors. It’s highly recommended for all floor types, including hardwood. Be sure to follow instructions and don’t go overboard; It produces a lot of suds, and too many could leave behind residue and cause your floors to appear dull. 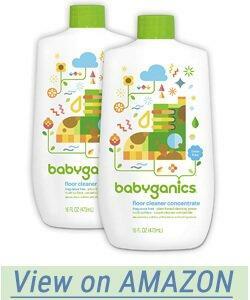 Babyganics has no shame in displaying the ingredients on the label since there’s nothing harmful to hide. This floor cleaner concentrate is safe for use on all types of flooring, including carpet. Most importantly, it contains no ingredients that would harm infants. If you are concerned about the health of your children and pets, then this cleaner is ideal for you. This cruelty free, dermatologist and pediatrician tested product is free of dyes, phalates, parabens, sulfates, phthalates, artificial fragrances and ammonia. Aside from its safety, it’s concentrated, so you’ll only have to use 1 oz for every 1/2 gallon of warm water. There’s no overwhelming scent since the product is fragrance-free. Now, for the not so good news. It’s not for unsealed wood. Furthermore, it may produce too many bubbles and end up attracting dirt from the residue left behind. This unique cleaner works to restore shine and eliminate the appearance of scratches. It works on multiple hard surfaces, such as tile, hardwood, vinyl, laminate, terracotta, linoleum, fiberglass and more. 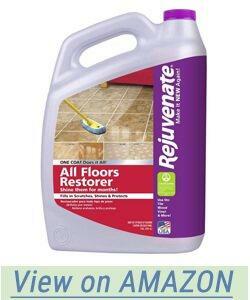 Rejuvenate protects floors from fading and seals them as well. The formula makes floors less slippery and safer by increasing traction up to 50%. It’s not exactly safe and should not be used around children and pets. You should also wear eye protection and gloves during use. However, it does wear the GreenGuard label, which stands for low amount of chemical emissions. Furthermore, this can harm floors that have polyurethane. Overall, this is an excellent product if used with caution. It has some safety elements and does what it claims to do. 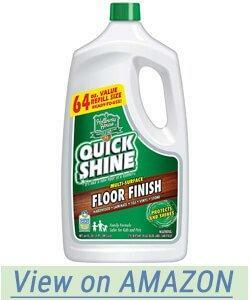 Quick Shine is a finisher designed to polish, protect and shine laminate, tile, stone, vinyl, hardwood and more. The water polymer formula creates a long-lasting shine. The makers of this product, Holloway House, went through rigorous tests to earn the Quick Shine Multi-Surface Floor Finish and Polish (Environmental Protection Agency) Safer Choice Label. To earn such an accolade, a product must be safe for the environment and the entire family, including children and pets. This means they are free of inorganic phosphates, dangerous solvents, harmful surfactants, and heavy metals. The product was evaluated on its performance, ingredients, ingredients disclosure, VOCs, packaging and the product’s pH. What we didn’t like about this product is that, although the initial use is picture perfect, it might in some cases end up much worse. The polish can leave a thick, white film, footprints and paw prints. Even worse, it may cause irreversible scratches and scuff marks. We recommend this product for use on floors with virtually no traffic. If you have children or pets, it’s almost certainly not worth the try. Although you’ll experience never seen before shine, it seems to cause grime to build up and damage some flooring. It’s best to ask your floor manufacturer before using this brand. This product is backed by a reputable company, one of the oldest in the polishing business. It’s a multi-surface finish that can be used on vinyl, hardwood, laminate, tile, linoleum and more. The multi-surface cleaner produces a transparent, quick shine, restoring old, dull floors and protecting them from damage. There is no rinsing required; just apply and allow 20 to 30 minutes to dry. The product is free of bleach. However, it does contain ammonium hydroxide, phosphates, and other possibly harmful or irritating ingredients. The label recommends this to be kept away from children. We recommend using protective gear when using and keeping this product away for pets and children. The shine may not last very long, and it attracts dust and dirt. With that said, floors should be cleaned often to avoid buildup and possible damage. Although the name says marble and tile cleaner, this multi-surface cleaner also works on granite, ceramic, stone, vinyl, travertine, linoleum and porcelain. It’s an easy to use, concentrated, streak-free cleaner that does not require any rinsing. It also has a neutral pH and a clean, pleasant scent that isn’t overwhelming. 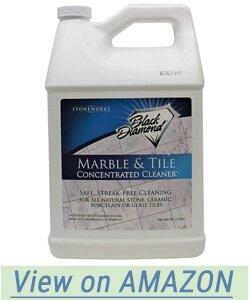 Black Diamond Marble and Tile Floor Cleaner is safe for floors and the entire family. It’s a hypoallergenic formula, biodegradable and eco-friendly. Although it’s claimed to be safe for the environment and hypoallergenic, the warning label includes an ethoxylated, alcohol and C9-11 hazard. The label also recommends wearing eye protection and gloves, as well as washing thoroughly after use. Not all ingredients are clearly disclosed on the label. Overall, this product shows promise in the area of cleaning without leaving behind residue. We recommend use if you are prepared to use it with caution. 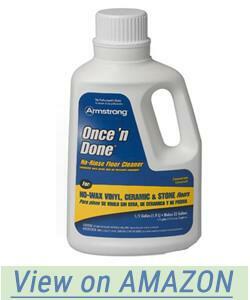 Proven to be very effective at cleaning hard surface floors, Armstrong Once ‘N Done is also easy to use. As the name suggests, it’s a one-step, no rinse process. It works on vinyl, ceramic and laminate floors, and the manufacturer claims it leaves floors dull-free and residue-free. We really appreciate that Armstrong Once ‘N Done can clean deeply set, stubborn grime with a good mop and elbow grease. Now for the not so good news. Maybe there should be no surprise that such an effective cleanser would have some caustic ingredients, such as ammonium hydroxide. However, the presence of the feature nonetheless completely shattered our hopes. Not only does ammonia come with a scathing smell; the harmful effects it can cause just aren’t worth the try. TOXNET, Toxicology Data Network, an affiliate of the National Institute of Health, lists a plethora of ammonium hydroxide side-effects and case studies. Some effects include blepharospasms, severe pain, blisters, trouble breathing, gastric and esophageal corrosion and the list continues. Ammonia also may not be good for certain surfaces, like hardwood or luxury floors. Just to add, Once ‘N Done is not for use on hardwood and doesn’t exactly specialize in shine. All things said we would recommend this product only with extreme care. If your dirty floors are getting the best of you and you’ve tried everything, then, by all means, use with caution. This floor cleaner can be used to protect and brighten floors, removing stains, dirt and even scuff marks. It’s formulated to prevent residue that causes a dull finish. There’s no need to rinse or dilute, and it has a subtle, pleasant scent. Shaw R2X is even safe to use on real hardwood floors. We couldn’t find many negative attributes. One downside is that it may still leave behind dulling white streaks and residue in rare cases. On the bright side, this usually occurs when floors already have pre-existing oil, residue or wax. Another caveat is that it may not be safe on painted floors. 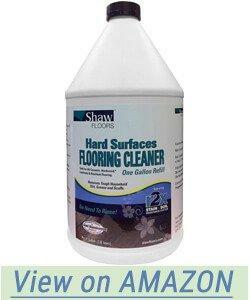 The Shaw Floors R2X Hard Surfaces Flooring cleaner is highly recommended. It’s flexible because it can be used on all floor types. It also deep cleans and doesn’t harm your floors. Is It Safe For The Whole Family? Many cleansers are made just to clean, and do not keep safety in mind. The standard cleaner will have potentially harmful ingredients, some more harmful than others. For example, as mentioned earlier, ammonium hydroxide can cause an unpleasant scent and is also harmful for your health. 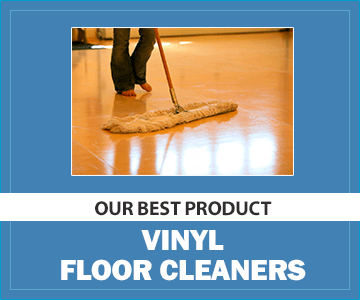 Peruse the list below that contains some of the popular Vinyl floor cleaning chemicals. Tox Town, an affiliate of the U.S. National Institute of Medicine, stated in one article that phthalates may cause harm to the reproductive system. It’s also known to cause cancer in humans. As stated earlier, use of this chemical comes with a number of harmful side-effects. One National Institute of Healthcase study includes a 54-year-old custodian who diluted the substance for cleaning on a daily basis over a course of 19 years. Exams showed the man had incurred cataracts and lung damage and had trouble breathing as a result of chronic exposure. Author Carol Potera, who published an article in Environmental Health Perspectives, stated that scented products can contain over 100 VOCs (volatile organic compounds). Many consumers reported irritation that resulted from using scented products. What’s more is that companies are not required to list all the ingredients, and they rarely do. An Environmental Health Perspectives article written by Nate Seltenrich mentions that a mother’s exposure to certain ethers can negatively affect her baby’s cognitive functions. For example, low verbal acuity scores were associated with the mother’s exposure to phenoxyacetic acid (PhAA). The EWG (Environmental Working Group)lists these types of chemicals as possibly harmful to the respiratory system. They can also cause skin irritation and cancer, affect a child’s development and harm the reproductive system. Although these chemicals are generally safe, they can cause eye and skin irritation, as stated in a US Library of Medicine article. Always read labels and instructions carefully. Make sure the area is ventilated before you begin cleaning. Be careful not to slip. Don’t allow the cleaner to come into contact with your skin or eyes. Even if a product is safe for children and animals, there is always a risk of slipping, so be sure they are not in the area while cleaning. Is It Safe For Your Floors? Many floor cleaners are known for removing dirt, stains and even scratches. However, there could be a price to pay. Prolonged use of cleaners has been known to cause permanent damage. Some may be abrasive, cause dullness or may change the color of your flooring. Be sure to only buy a cleaner that is safe to use on your flooring or deal with the risks. If it’s not in your budget, then don’t buy it. You can easily find safe and effective floor cleaners for reasonable prices. Do research to compare prices and read reviews to determine the quality level. Just don’t assume a high-priced product works better than a lower priced one. To make the job easy, invest in a microfiber mop or microfiber cleaning pad to use in conjunction with your cleaner of choice. Microfiber is one of the most effective cleaning materials for a number of reasons. The University of Washington Field Research and Consulting Group names microfiber a superior cleaning instrument because it promotes thoroughness, captures microbes and requires less water and chemicals. Microfiber can easily get in between tiny spaces because of its small fibers, which are 1.0 denier or less. The material can easily absorb dust molecules and bacteria. In fact, the group included a study that found that a microfiber mop can reduce 99% of bacteria; whereas, a cotton mop reduced bacteria by 30%. In addition, microfiber comes in various color, which allows you to color code, reducing cross-contamination. While hot water may be abrasive to some surfaces and possibly a safety hazard for you and your family, warm water can really make a difference. Some cleansers may not require the use of water, but if so, warm water can help loosen dirt and oil. On a final note, vinyl floor cleaners come in a variety of options. Whether you are more concerned with your floor’s appearance or preventing health hazards, there’s a cleaner that can meet your needs. Be sure to follow the tips and guidelines in the buyer’s guide to help you along the way. Carpet cleaner sprays can be used for single stains, multiple stains or entire carpets. Hi. My name is Joan and I have been involved in providing cleaning services for commercial and residential customers for over 20 years. I love helping people, so I started writing blog posts offering advice on using cleaning products. Doing cleaning product reviews has been a labor of love. Plus, it’s pretty easy. I simply tell people what products I have tried and whether or not they work well. I’m not a saleswoman pushing any particular brands or products. I’m just someone who likes helping others. Here’s more about me and why I started this blog. AFFILIATE DISCLOSURE Some posts may contain affiliate links. cleanhomeguide.com is a participant in the Amazon Services LLC Associates Program, an affiliate advertising program designed to provide a means for sites to earn advertising fees by advertising and linking to Amazon.com.